Dr. Cecil C. Gray signs the Gates Compact while Commissioner Neil Duke, left, CEO Dr. Alonso, and CBCS Co-Chair Bobbi MacDonald look on. 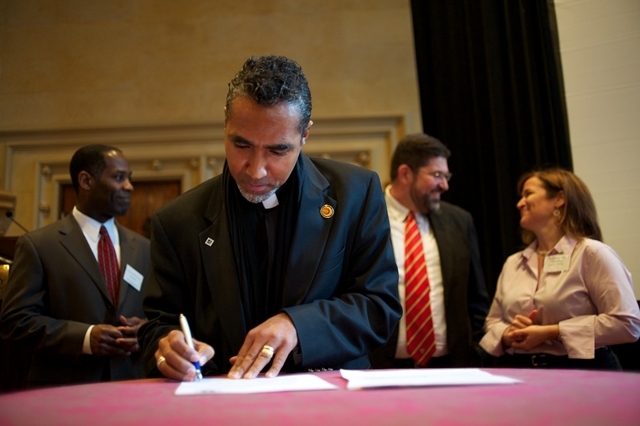 Dr. Cecil C. Gray and several other Baltimore City leaders signed a historic compact on Friday, April 8th. The collaborative agreement is an inititative of the Bill and Melinda Gates Foundation. The multi-year alliance was created to encourage collaboration between public charter schools, public traditional schools, the public school system, the mayor&apos;s office, and supporters of public charter schools in the City in an effort to make a high-quality education available to all students. Eight other cities in seven other states across the nation have signed similar compacts. The agreements were finalized at a conference in Denver, CO this past December. The Northwood-Appold Community Academy opened as a public charter school in August 2005. The school served grades K through 2 in its innaugural year. It has since grown to serve approximately 450 students from throughout Baltimore City in grades K through 8. NACA enjoys support from members of its local board of directors , its community partners, and members of its national board, including poet laureate Professor Sonya Sanchez, professor and freedom movement veteran Dr. Vincent Harding, and former Surgeon General of the United States Dr. Jocelyn Elders, among others.